A complete set of golf clubs has woods, irons, a putter and sometimes hybrids. 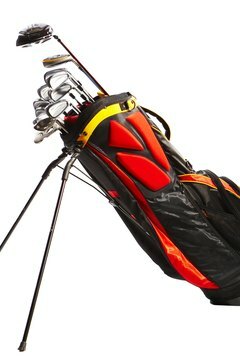 What constitutes a complete set golf bag varies based on the manufacturer. According to United States Golf Association guidelines, golfers can carry a maximum of 14 clubs. The clubs you use depend on your ability. The traditional set of clubs consists of a driver; a couple of fairway woods, such as the 3 wood and the 5 wood; irons from the 3-iron to the 9-iron; a pitching wedge; and a sand wedge. Many sets now substitute the 3-iron and 4-iron with newer clubs called hybrids, which high handicappers find easier to hit than long irons. Many complete golf club sets come with two fairway woods, often the 3 wood and the 5 wood. High handicappers might look for a more forgiving, larger faced club with a flexible shaft. If the set comes with a 3, 5 and 7 wood, beginners can consider using the 3 wood off the tee in place of the driver and the 5 and 7 wood for fairway shots. Offset clubs, in which the club head is set back behind the shaft, may help you achieve more accuracy with a straighter shot. The traditional golf club set comes with 7 irons. In addition, a set will most likely contain a pitching wedge with 4 degrees more loft than the 9-iron, along with a sand wedge with a loft of 56 degrees to get out of bunkers. Beginners and high handicappers may want to set aside the 3, 4 and even the 5-iron, which are longer than the other clubs and harder to hit. Look for a wide, rounded sole and deep back cavity with perimeter weighing to help with a slow swing speed. Irons can also come in offset design. Experienced players may be able to handle a lob wedge and a gap wedge, which might not come in a golf club set. Many players are use hybrids to replace the 3- and 4-iron. Some complete golf bag sets now include a couple of hybrids, such as the 3 and the 5. Hybrids have a flatter clubface, like an iron, and the weight is distributed more toward the back and bottom of the club to make it easier to swing. These clubs are shorter than a fairway wood and feature a wider sole than an iron. Golfers with a slower swing speed will find it easier to get the ball up into the air while achieving more distance and accuracy with a hybrid than with long irons. There are golf bags designed for use on a golf cart, for golfers who carry their bags, and for players who travel. Golf bags typically feature compartments for each club and pockets on the outside to store balls, tees and valuables. Some golf bags have special features like an insulated pocket for cold drinks and an external holder for the putter. In addition, they come with a rain hood and a ring for a golf towel. Golf bags that come as part of a complete set tend to be lighter and possess fewer compartments and features.